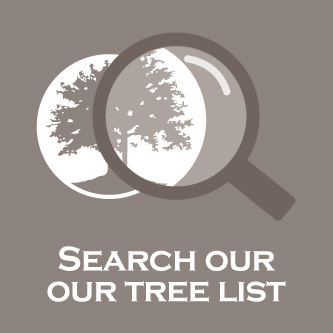 At all times Mt William Advanced Tree Nursery carries out best nursery practices to produce "Quality Trees From The Roots Up". 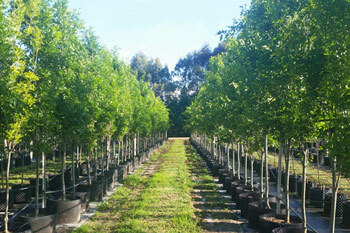 Mt William Advanced Tree Nursery is a grower very conscious of producing a quality product not only in relation to correct branch structure and form but also a correct and well developed root system. 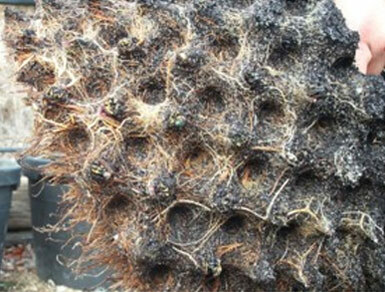 Roots of a Lagerstroemia after being grown in Rocket Pots® for 18 months after being loose rooted from the ground. Because of the conscious decision we have made in relation to root systems in containers, air pruned containers (Rocket Pots®) is the main form of production and any hard walled pots used are treated with SpinOut®. 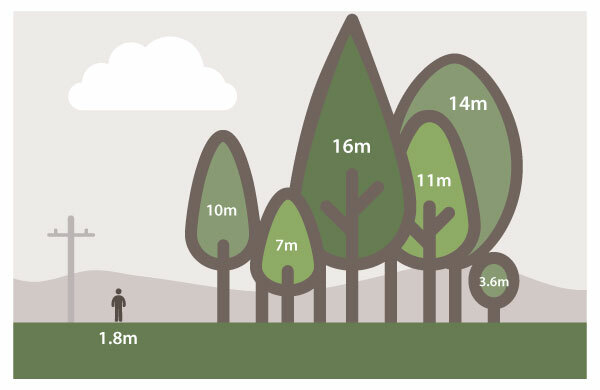 Kinked and girdled root systems have proven to have devastating effects on early tree growth and can be the cause, of higher transplant failure and or the need for greater maintenance to re establish trees. SpinOut® is a copper hydroxide based product that was developed by the Griffin Corporation to control undesirable root growth and produce plants with high root regeneration potential. SpinOut® is applied to the inside of the container and it helps prevent root elongation once they reach the edge of the container. 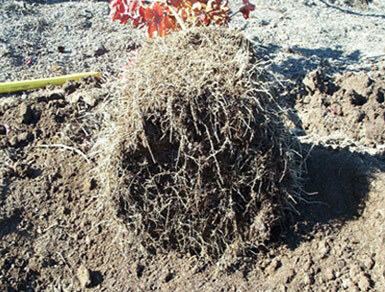 Apical dominance is interrupted and new roots develop further back from the root tip. 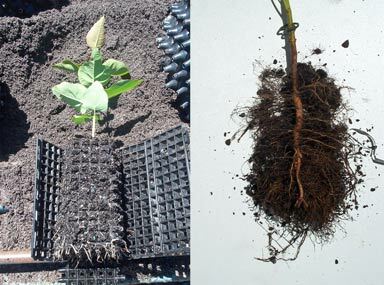 Just the same as Rocket Pots® root spiraling and matting is prevented and the plant produces a shorter, finer, more fibrous and healthy root system. Due to the higher oxygen permeation rate of air pruned containers and in particular Rocket Pots®, allows the use of a finer potting media without loss of growth rates and other associated problems when trying to use a finer mix in hard walled pots. Lower air filled porosity media allows a better match with soils that are in the landscape and have a higher water holding capacity. 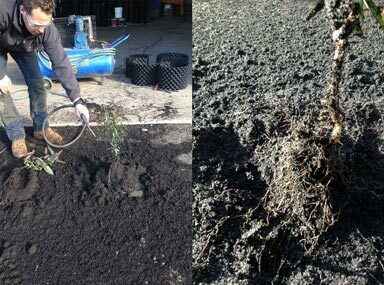 Showing the side of the the Lagestroemia root system with the Rocket Pots® removed.Air root pruning is where the root tips are guided to holes (cusp) in the side of the container and holes in the base where they desiccate. Several new roots emerge and each new root grows to a cusp and desiccates. This process repeats again and again causing an exponential increase in root development. When this process occurs the root loses its apical dominance and root branching occurs, which in turn, gives the root system a far greater capacity to absorb water, nutrients and a greater capacity for the tree root system to establish into the surrounding soil, after transplanting. 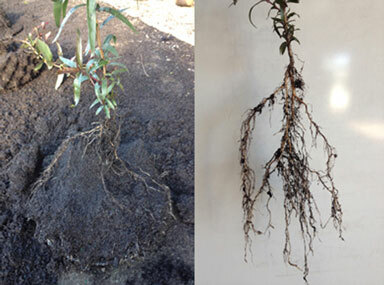 Roots of a Lagestroemia after being grown in a Rocket Pots® for 18 months after being loose rooted from the ground. With Rocket Pots® air pruning not only happens on the side but the base as well. 18lt R/P container is removed. At all Stages of production, root investigation is carried out from a sample of production stock to ensure correct root development is occuring. By doing this sampling, it enables us to determine that the direct seeded Australian Natives that are propagated in air pruned containers are developing with correct structure and form.